I’m excited to say that I am now finished with two customs, Linus and Alianora. 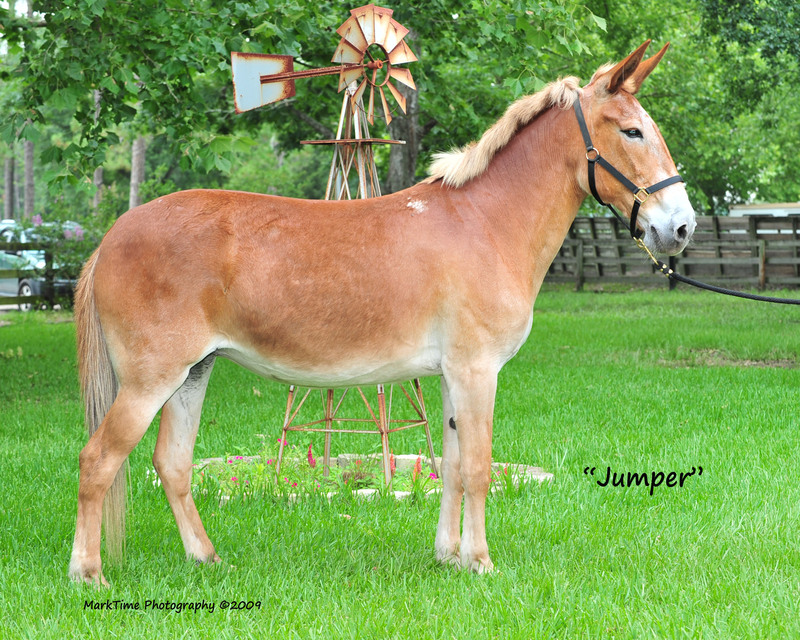 Linus is a commissioned trade for my Chips Thoroughbred and Alianora is now up for sale on MH$P. My fake studio pictures above were really pretty simple. I took advantage of the bright morning and added the power of my stove top light to the natural light flooding in. 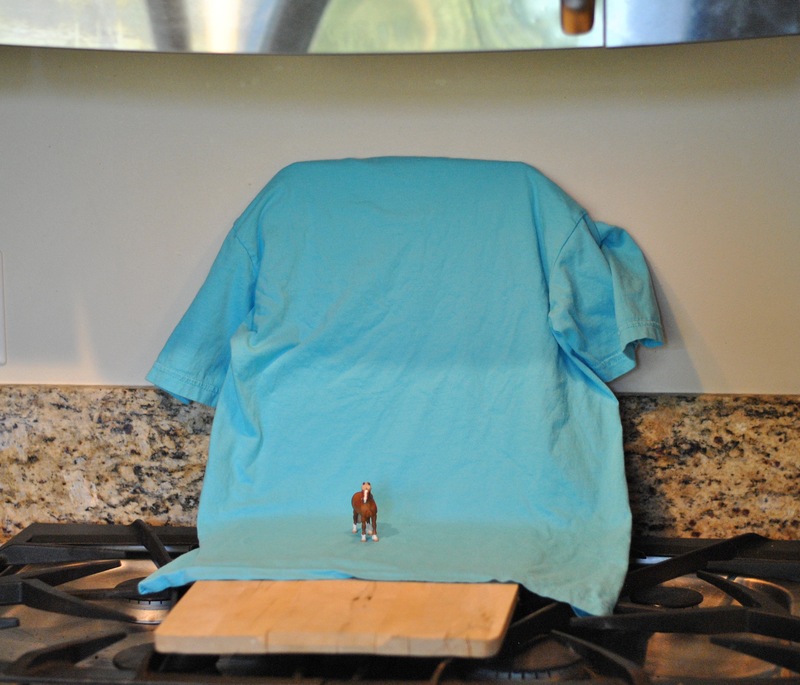 My backdrop is just an old t-shirt, and my base was a cutting board. None the less, I’m very pleased with how my photos came out! 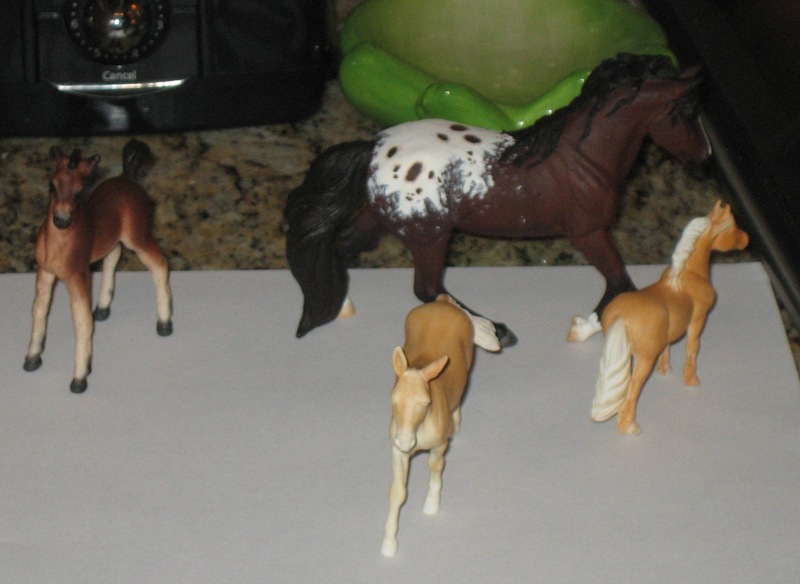 Now that I’m finished with the race horse diorama, the various WIP ponies that had been temporarily shelved are getting my attention once again. It was very pleasant to be pastelling again. 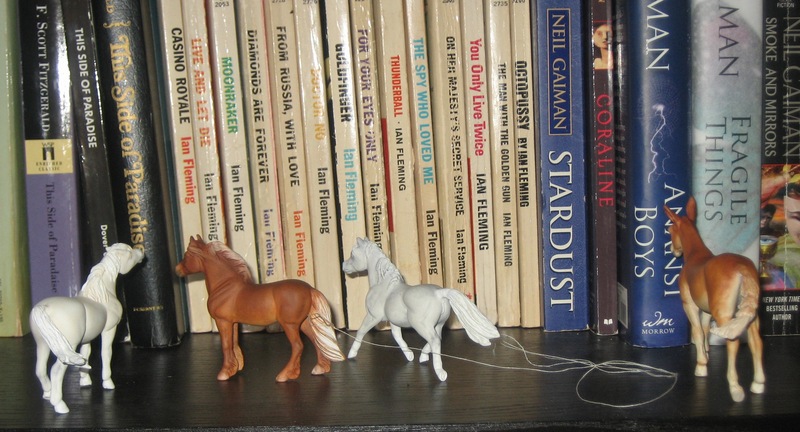 And I’ve got two horses almost finished and two just beginning, which is a nice balance. The two greys are just beginning to come to life and with be in that awkward stage for a while. The two chestnuts are near completion so I can really start to see the results of all those layers. 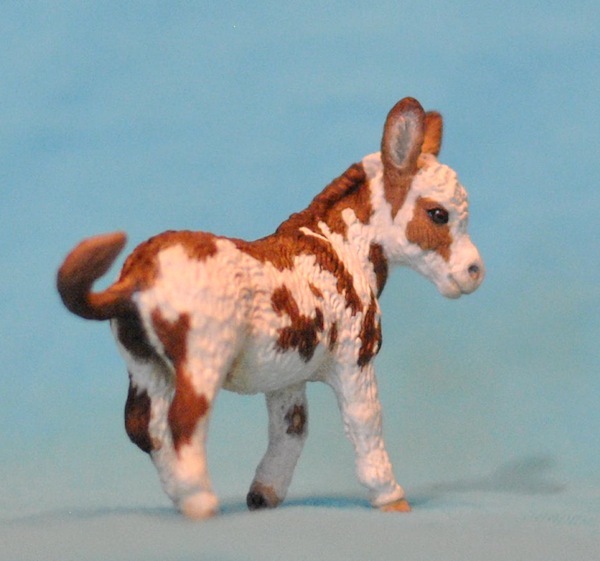 I’m pretty stoked with how this chestnut pony is coming out. After so many layers of chestnutty hues it was time to put in some details so I can see how the coat color is really turning out. I used a lot of different colors in the mane and tail, which was fun and challenging. I’m also super pleased with how the white markings are turning out- I think they’re my best yet. Definitely the smoothest. I’ve always heard that to get nice smooth markings you have to do lots of layers and you want the paint to be the consistency of milk. 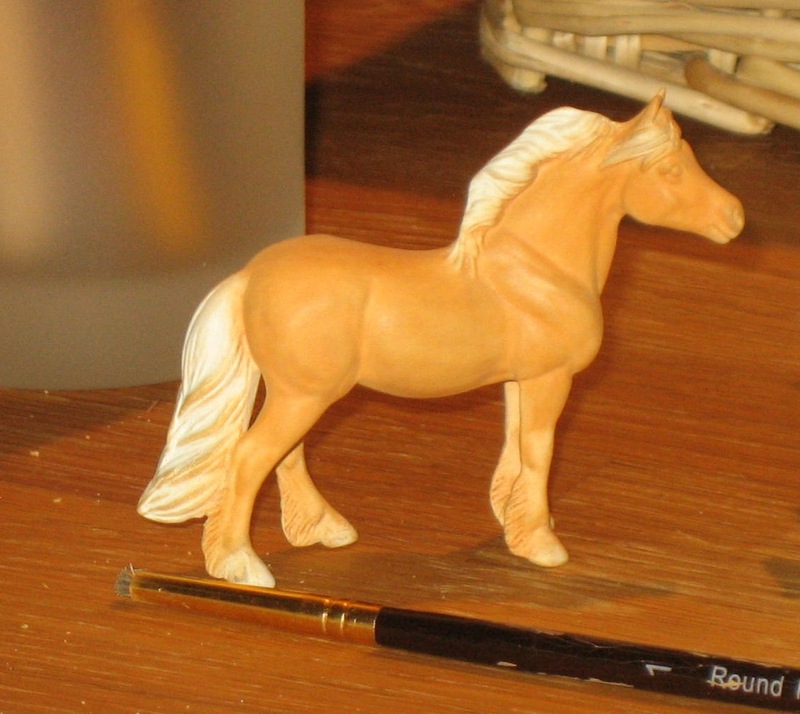 That has always been tough for me, because it seems like when I have it that watery the brush deposits bubbles on the horse and very little pigment. This time I did something a little different. I mixed water into pigment to about the consistency of milk, but before applying to the horse I wiped the brush on a towel. So my paint was “milky” but the brush wasn’t terribly wet. And I dipped back in a lot, went slowly, and did a lot of layers. Next I’ll buff the markings with a sock, and then do another round of white. 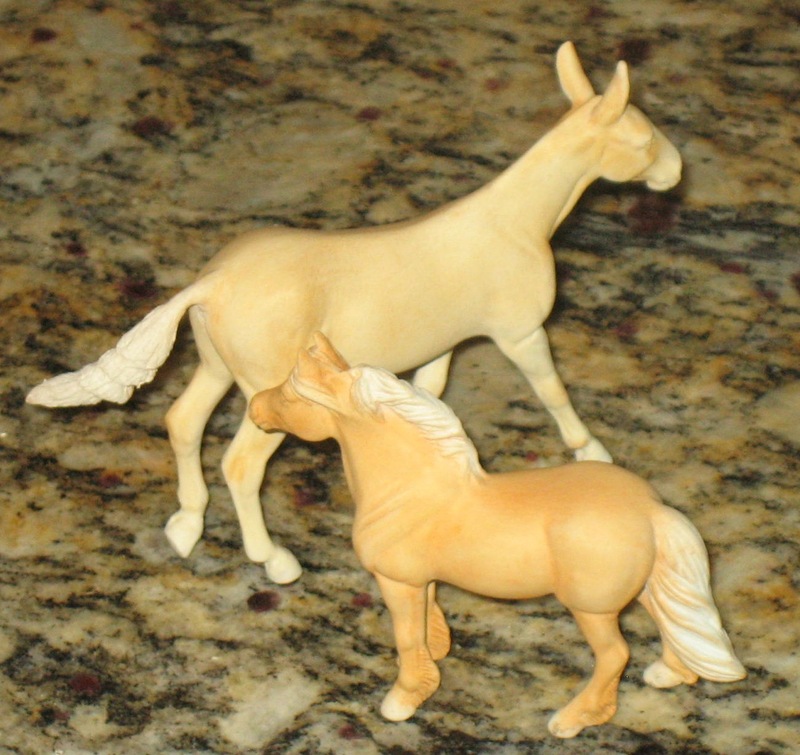 Tonight I put another layer on my mule (Troy Soldier) and my G3 pony (unnamed). Earlier this year when I finally got my hands on Dullcote, I thought my fixative woes were over. Yesterday when I was trying to put a layer on the pony I was unpleasantly surprised to find that the pastels weren’t sticking very well to his barrel. “WTF?” I thought. “I fixed the last layer so he should have plenty of tooth!” Then I realized, duh, that the last layer was on his legs- and I had held him by the barrel in order to spray the fixative. So of course that area wouldn’t have tooth. So now I’ll remember to spray twice- once to fix, and once to add tooth to the area where the next layer will go. Random Pastel Tip: when you’ve completed a layer of pastels, check over your horse to make sure the dust hasn’t fallen and been smooshed onto any areas where it isn’t supposed to be. Often when I am putting on a rich layer of color, the dust will fall and get trapped between my glove and the horse, so the pressure of my hand applies it to the horse. The chestnut dust has fallen onto the light areas on the legs- you can see a particularly dark smoosh mark on the inside of his knee. This is where a good moldable art eraser comes in handy. They are pretty cheap at art stores and are a good addition to your pastelling tool box. 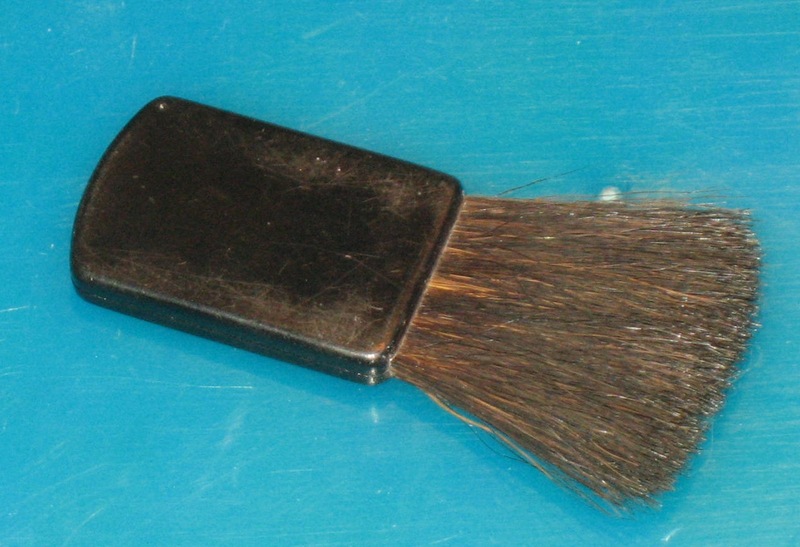 Do NOT use one that has been used to erase pencil marks, lest you get residual graphite on your horse. Another good tool for getting rid of (less persistant) errant pastel dust is a make-up brush. I acquired mine by buying an unused makeup kit at a garage sale for a pittance and then chucking the makeup. Make sure you get an unused brush and then keep it nice and clean so dust does not move from model to model. These are especially nice for getting excess dust out of pesky spots like in ears and eyes and other sculpted details. The brush is nice and soft, so it only removes the surface dust and doesn’t take off the applied color. 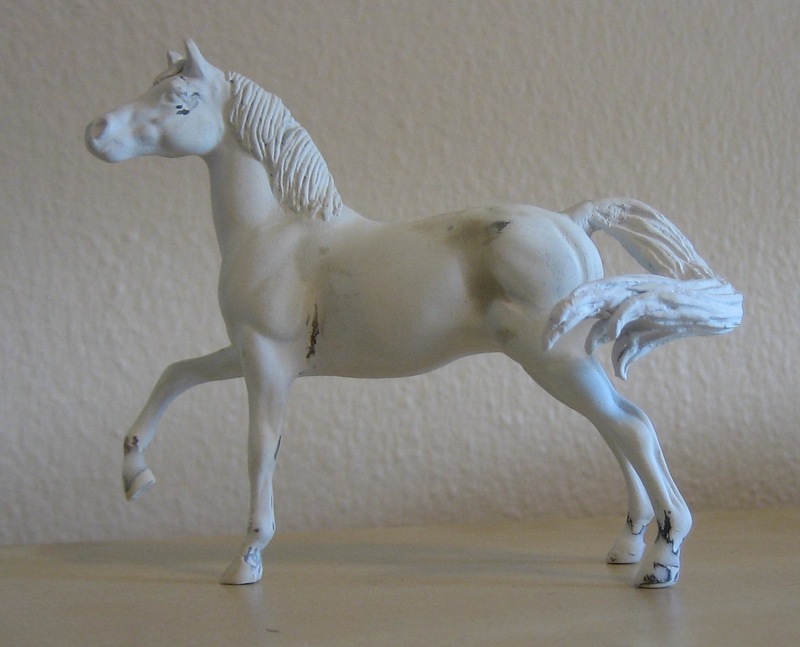 Usually by the time I have a horse in primer I’ve given it a name and planned a color. But not so for the horse I’ve been referring to in my notes as “Head up mare” (She has a corresponding sister, Head down mare). She’s come a long way from her original digital mock-up to her current status as an almost-ready-to-paint creation. So now it’s crunch time to pick a color. She did give me a hint and told me that she should be some kind of chestnut, but there are so many beautiful choices out there. I’ve narrowed it down to seven reference horses (click to enlarge). 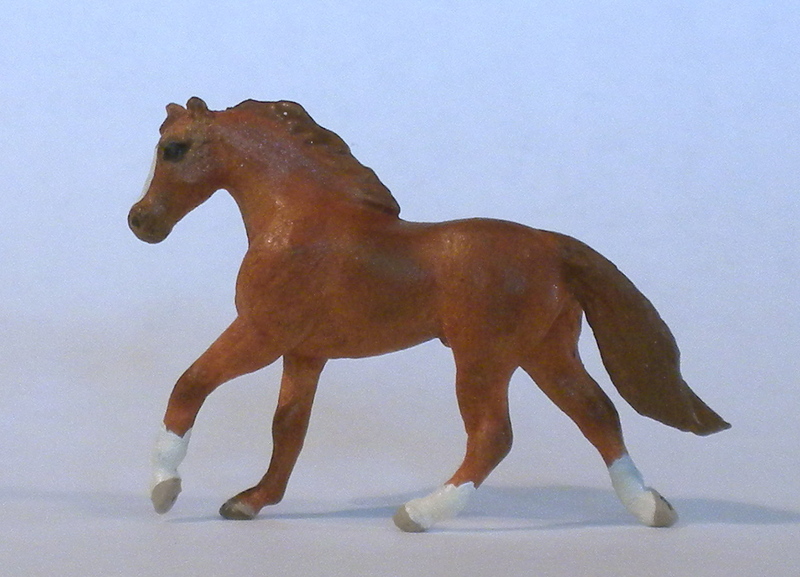 I have been working on my chestnut MM cantering horse and am very pleased so far. The white marking really made the color pop. 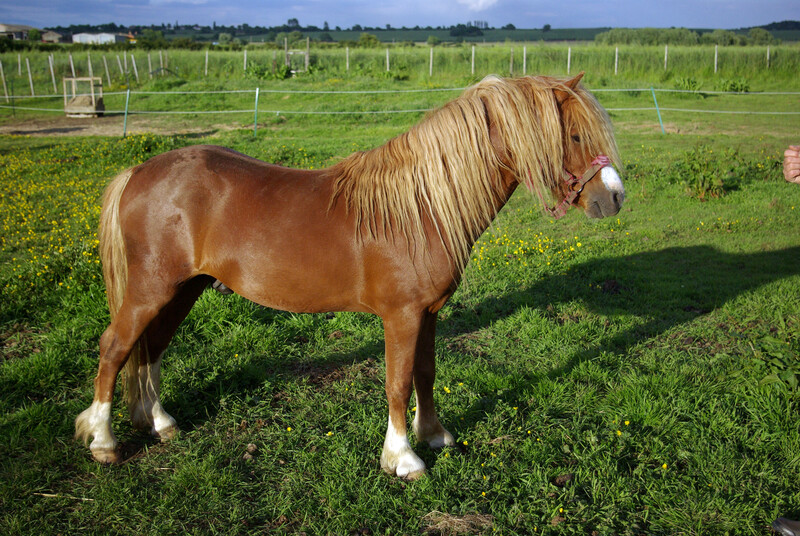 But suddenly I realized that although I have been imagining him as a stallion (and he is rather manly and majestic, IMO) he had no stallion parts. So, feeling adventurous, I actually added epoxy after painting. I was super careful to use clean tools and have clean hands. Also, I experimented and added burnt sienna pastel dust to the epoxy before adding it, thus tinting it much closer to the shade of his coat. It’s not the exact color, but a good start. You can see a bit of his new sheath in the picture below, and it blends in tolerably–certainly better than the off-white of epoxy. 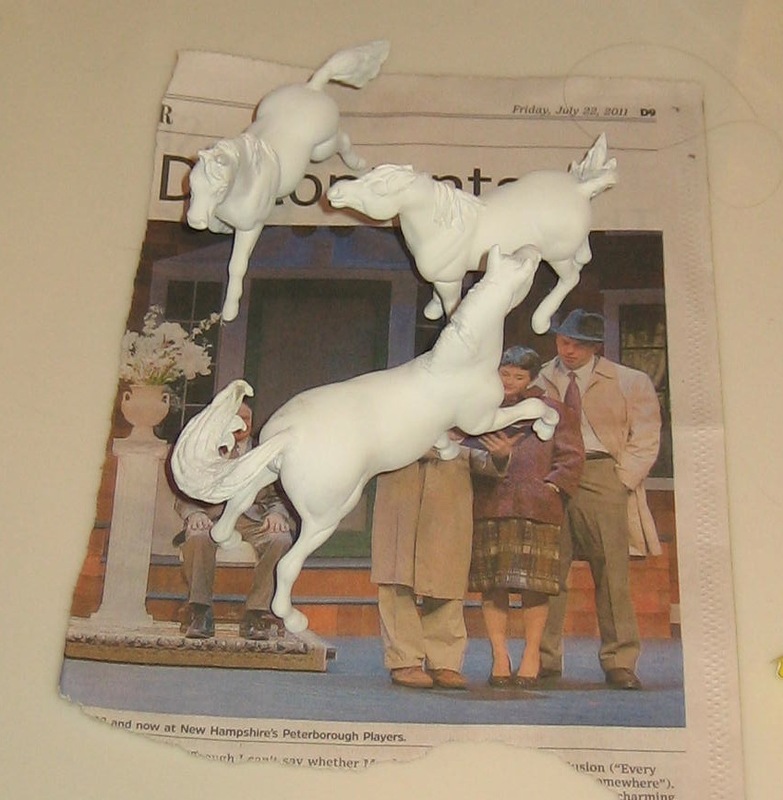 I’ll probably have to sculpt a bit more with thick acrylic (I certainly can’t do any sanding!) but I think this is going to work… as long as the pastel dust doesn’t make the epoxy, er, fall off… how embarrassing for my poor stally that would be! His true color is a bit brighter and redder (rather Secretariat-esque, actually) and he still lacks facial details, hoof detailing, etc. 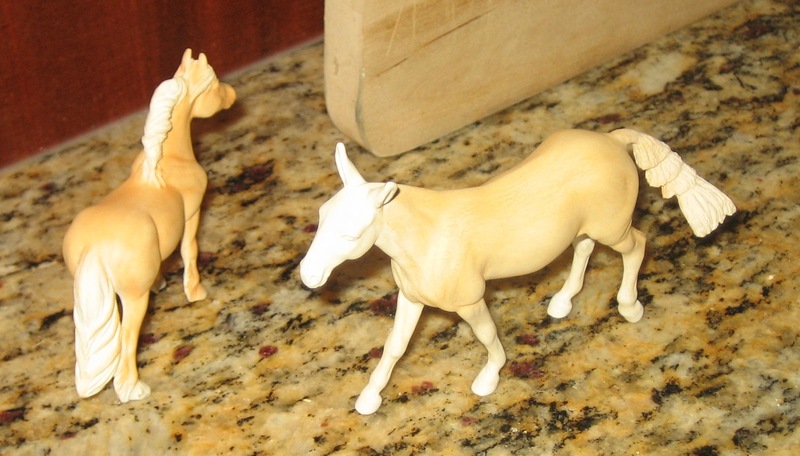 In the same epoxy batch I did some under-the-tail detailing on my mule, so my sculpting was rather focused today. 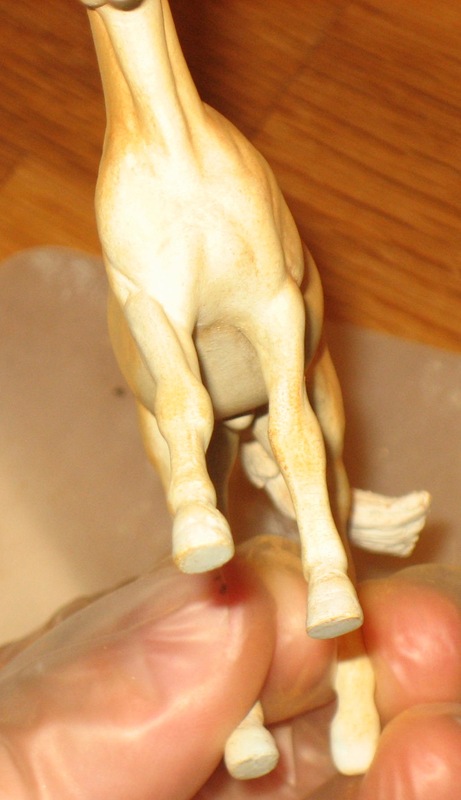 And this is why I get made fun of by my housemates- I spend my free time sculpting tiny horse genitalia. 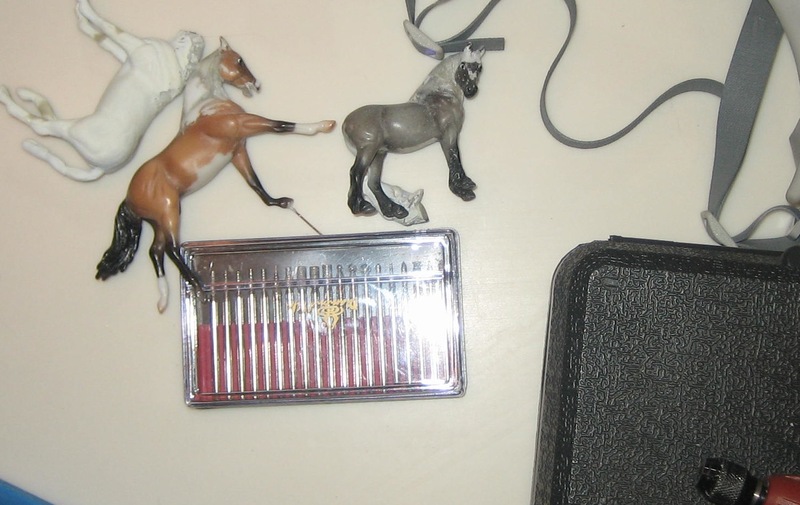 While working on my mule’s tail I was once again delighted by my irreplaceable file. It’s a great tool, even though one might think that its large size makes it mostly useless for minis. But it’s very useful for taking off large areas of epoxy or doing straight edges, and it doesn’t tire out like sandpaper. 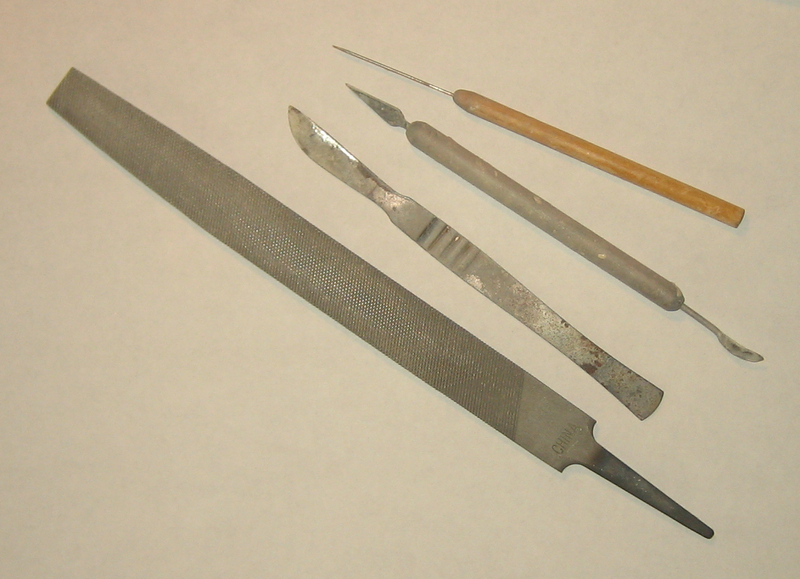 Plus, I can use it to sharpen my other sculpting tools. Inevitably despite my efforts I get dried epoxy all over them, and fine edges become crusty. So every once in a while I just file down my tools and voila, they are good as new and ready for fine detailing!